Alphonse Areola // 22 // Villareal // Goalkeeper: The 22-year-old keeper, currently on loan at the Yellow Submarine from PSG, is having a good run of late. He recently featured in our Keeper Rankings, and with performances as consistent as his, why not? The hallmark of a good goalkeeper is that he does a good job even when he doesn’t have much work to do in a match. This is exactly what Areola did this past weekend in the goalless draw with Las Palmas. The keeper ensured there was no drop in concentration, and got the job done with minimum fuss, as the Spanish sides continue to surprise viewers this season. Mitchell Weiser // 21 // Hertha BSC // Right-Back: Young Mitchell Weiser stole all the headlines for the winning (and only) goal of the game in a potential banana peel fixture away at Ingolstadt. The plaudits though, have to be reserved for his excellent defensive work rate and calm demeanour at the back. Weiser held sway over his opposite number for large parts of the game, making 3 tackles over the 90 minutes. Alessio Romagnoli // 20 // AC Milan // Centre-Back: Romagnoli was the subject of tense transfer negotiations in the summer between Milan and Roma, with the former eventually winning out. The young defender was brought in with great expectations, and will repay the faith slowly. The performance against Sassuolo was a gritty one, aided no doubt by the early red card for their keeper. Despite the apparent ease of the task, the youngster looked very assured, and more upto the task than his older and more experienced colleague, Alex. 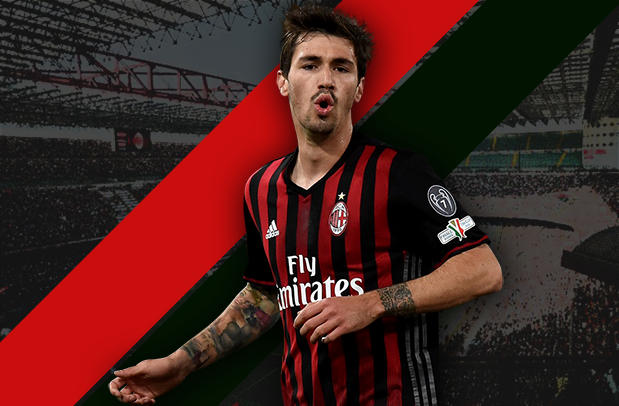 Romagnoli will hope to keep playing to cement his place in a changing Milan team. Samuel Umtiti // 21 // Lyon // Centre-Back: Lyon have had a shaky start to the Ligue 1 season and rather uncharacteristically, it has been the attacking unit which has let the French giants down. The defence on the other hand has done its job, marshaled admirably by the impressive Umtiti. The 21-year-old has played a key role in a defence that has conceded just 7 league goals, a record bettered only by PSG and Angers. The young defender’s most important contribution against Toulouse came in the form of a goal-line clearance. Martin Braithwaite would have thought he had done enough having beaten Lopes in goal but Umtiti was on hand to preserve the clean-sheet. Nathan Ake // 20 // Watford (on loan at Chelsea) // Left-Back: Watford have made great use of the loan system in the recent past, with many recruits coming through that path, and the impressive young Nathan Ake is the perfect symbol: on loan from the greatest loaner to the greatest loanee. The Dutchman, who likes to play centrally in either defence or midfield, was shunted out to the left in this fixture. Ake let his defensive prowess come to the fore, making 4 tackles and 3 interceptions in the game. An important contribution in what will probably prove to be a priceless clean sheet away from home for Watford against Stoke City. 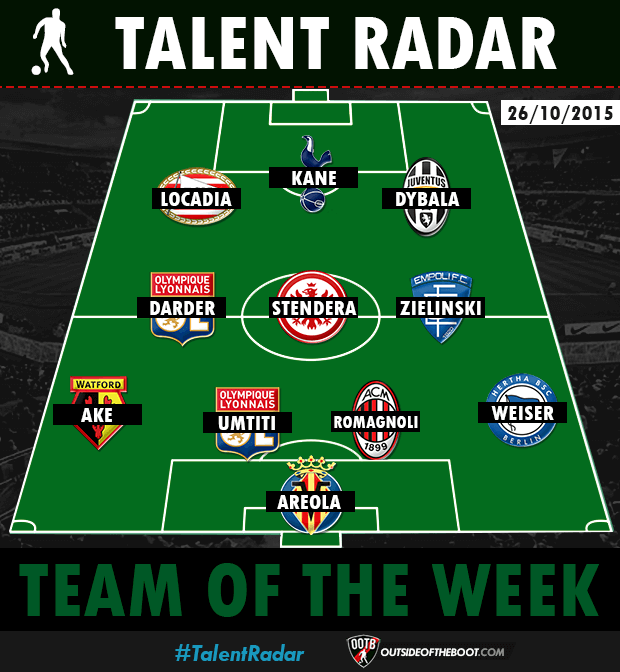 To know more about football’s young stars, read our 100 Young Players to Watch in 2015 feature. Piotr Zielinski // 21 // Empoli (On loan from Udinese) // Central Midfielder: Empoli came into the latest round of Serie A fixtures a bit too close to the relegation zone for their liking and were glad to get all 3 points against Genoa courtesy a 2-0 victory. The second goal came from Zielinski as the Polish midfielder delivered one of his better performances of the season. The midfielder threatened Perrin’s goal early in the game but saw his ferocious drive go over the top. He was not to be denied in the second half though as Maccarone’s shot cannoned off the cross-bar and fell to the 21-year-old who had the simple task of heading it into the empty net. Marc Stendera // 19 // Eintracht Frankfurt // Central Midfielder: As Eintracht Frankfurt overcame a one goal deficit to beat Hannover, one would have expected the heroics of a certain Alexander Meier to be the subject of much discussion. Yet, it was 19-year-old Marc Stendera who walked off with the goalscoring accolades. To be fair, Meier played a prominent role in the equalizer as his header set-up Stendera who sidestepped a defender before finishing well from the edge of the area. The 19-year-old then scored what turned out to be the winner once again displaying great composure as his first touch took him past a defender before he beat Zieler with a powerful shot. Sergi Darder // 21 // Lyon // Central Midfielder: The Spanish midfielder had a first half to remember in Lyon’s 3-0 defeat of Toulouse. Darder opened the scoring on the night as he got on the end of Mathieu Valbuena’s measured cross. A well cushioned first touch on the chest wrong-footed the nearest Toulouse defender and the 21-year-old made no mistake with a calm finish. He nearly doubled his tally before half-time as he arrived at the right time in the box but could only side foot Lacazette’s cross on to the upright. Jurgen Locadia // 21 // PSV Eindhoven // Striker: PSV currently sit 4 points off the top of the Eredivisie, and the Champions League hopes are also delicately balanced. With that in mind, they will welcome such form from their players with open arms. Against Twente, Locadia was as incisive as a hot knife on butter. The player made the difference for his side, with a goal and an assist from his 3 shots on target. Restricting talk to that would be ignoring his creativity from the left side on which he started, supplying 4 key passes for his teammates. With important matches in the Champions League coming up, PSV will hope that Locadia can reproduce this form on the European stage. Harry Kane // 21 // Tottenham Hotspur // Striker: The youngster who could do no wrong last season started this one off on a quiet note. A dip in form was of course expected but the qualities aside from the goals that so impressed last time around were still there for all to see. It seemed to be a matter of time before Kane returned to his old ways and it was Bournemouth that bore the brunt of his prowess in front of goal. 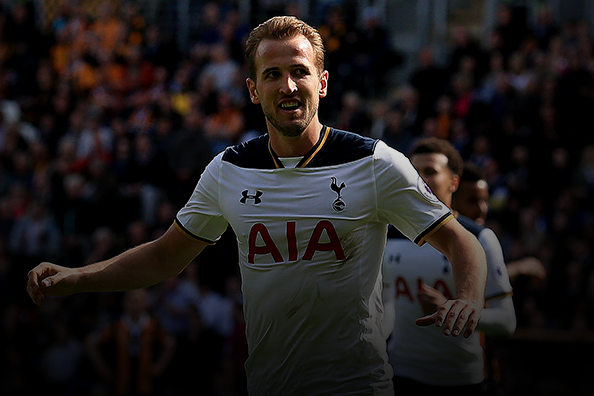 Kane dusted himself off after being upended to get his first from the spot. The 21-year-old completed his hat-trick with two goals from inside the penalty box in the second half to cement his return to form. Paulo Dybala // 22 // Juventus // Striker: Since his arrival from the South of Italy to Turin, Dybala has faced a frustrating time. The Argentine wonder kid hasn’t been given regular playing time, and mostly been restricted to cameos under Allegri. Consequently, his form has also been streaky, and he’s struggled to build momentum. This past weekend though, the player got a chance, and played a wonderful role, scoring, assisting his fellow new signing Mandzukic, picking up a yellow card, and presumably also driving the team bus home after pouring everyone’s drinks. The potential is there to be seen. Will Allegri take heed and choose Dybala as first choice? If this was fantasy football, gambling online is easy but in reality, he’s just got to know how the odds work.